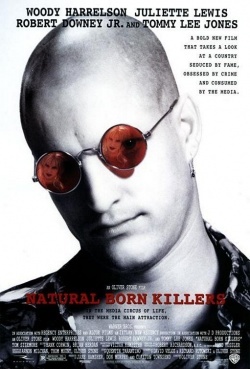 Natural Born Killers is a movie directed by Oliver Stone. It was released in 1994. The story is written by Quentin Tarantino (he wrote the original screenplay), but the shooting script is written by David Veloz, Richard Rutowski and Oliver Stone. Starring Woody Harrelson, Juliette Lewis, Tom Sizemore, Rodney Dangerfield, Tommy Lee Jones and Robert Downey Jr..
Maverick director Oliver Stone took Quentin Tarantino's script and turned it into one of the most controversial and violent epics of madness to ever hit celluoid. Natural Born Killers tells the complete reciprocal love tale that True Romance did, except twisted on an acid trip. The film follows the exploits of two psychotic serial murderers, Mickey and Mallory Knox, in love and on the lam along route 666. When the media follows the couple, leading to their arrest in prison, the tale becomes less about them and more about the world's seething penchant for violence. To date it remains the only film Quentin Tarantino has been connected to that he has vocally expressed his dislike of. This page was last edited on 6 September 2015, at 18:09.